The amount of emails I've received about The Thirst have far exceeded those of any other section on this blog. With this in mind, I do apologise if I've used your article and haven't attributed it to you - it was purely an oversight. I hope you enjoy this mix of articles that range from (almost) scientific to relatively soft and visual heavy. I stumbled upon this old blog post from Ronald Pattinson, one of the foremost experts in historical beer styles, whilst researching the next What's in Style post. In it he postulates that Claussen, at the Carlsberg Brewery, was not the first person to discover Brettanomyces, as history would have us believe. I'm going back to Munchies' Craftwerk series for this one. I thought this was a really cool piece looking at their operation and the challenges they face by being in such an isolated area. Some of the innovations they've made to keep their brewery running are really cool, although I'd be interested to know how consistent their batches are considering the massive temperature swings... I'd be keen to get my hands on some of their beers when their bottling line is fully up and running. Much like the Craftwerk video I'm venturing back to my last post and All About Beer, in particular Boak & Bailey for this next piece. Beer rating has become such a massive thing over the past 10 years - and Ratebeer's Top 50 List is, arguably, the highest pinnacle. This is the story about Britain's only entrant in the Top 50 - Old Chimney's Good King Henry Special Reserve - and it's relative lck of fame outside beer rating circles. **This isn't the time to discuss the merits/follies of rating beers across styles and how this sort of rating system tends to favour Russian Imperial Stouts... That's for another day. The article talks about soon to be ratified changes to the excise tax on craft beer in the United States. The graph showing the increase in craft brewers after the last excise tax cut shows the benefit that it could have. Australia needs to take note! Our excise tax on craft beer is significantly higher than those in the United States, presenting obstacles for brewers & consumers alike. Credit to Dan for sending this one to me. This link was sent to me by 3 or 4 different people. The author goes through pretty much exactly the same thought process that I did when first presented with Fruit IPA's. I still for the life of me don't understand why I didn't think they would work. Fast forward to present day and I think BrewDog's Elvis Juice is one of the best beers I've had this year! The article title pretty much says it all. From the world's oldest brewery, to the world's highest brewery, to a brewery housed in a church, and one in a skyscraper. This is a straight forward article which got the nod because of the pictures that accompany it. This book is quite different to most of the other beer books I read... 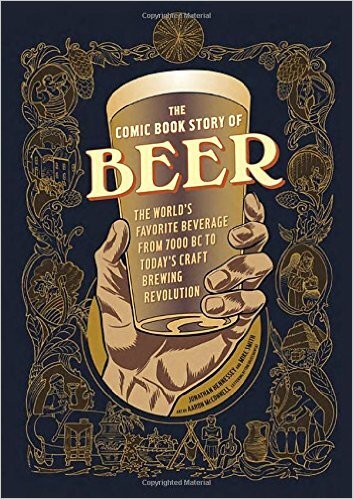 It's a comic book that tells the history of beer throughout the ages. 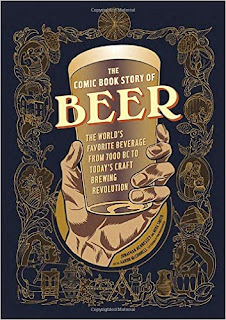 It's really well researched and put together by Messrs Hennessey & Smith and presents the history of beer in fun bite sized pieces. It is also worth mentioning the wonderful job done by artist Aaron McConnell, who makes this book an excellent visual experience. If you're into comic books, this is well worth your money.